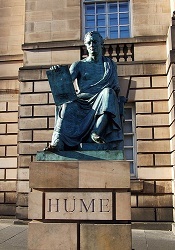 This modern bronze statue on a Clashach sandstone plinth depicts David Hume, the Scottish Enlightenment philosopher. 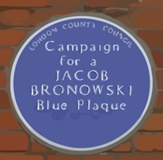 It was commissioned by the Saltire Society, as part of its 60th Anniversary celebrations and the funding for the project was derived from an international appeal headed by the Duke of Edinburgh. It was cast at the Powderhall Bronze Foundry and unveiled on St. Andrews Day, 30 November 1997 by Professor Sir Stewart Sutherland, Principal and Vice Chancellor of the University of Edinburgh. The statue is situated in front of the High Court Building (formally the Sheriff Court) on the Royal Mile.